It’s an unwritten rule of church relations: If you want to get into an argument as fast as possible, question a brother or sister’s favorite song. The rule applies to every church tradition from a cappella psalm-singing to contemporary worship music, including the URCNA. Synod 2016 meets in Grand Rapids next week, and I think it’s reasonable to say that it’s going to be a difficult meeting. Decisions related to the Psalter Hymnal are by no means the only issues of importance on the agenda, but they will be painful nevertheless. A new book means some of our most beloved psalm settings and hymns may end up on the chopping block—and let’s admit it now: that hurts. Our federation-wide sensitivity to the topic of church music has been revealed to me in several communications I’ve received from URC pastors, elders and members in recent weeks. I’ve heard opinions ranging from the overwhelmingly positive to the astonishingly critical, and I’m glad to listen to and learn from all of them. Yet I can’t help but wonder if we’ve adopted a double standard in evaluating the new book. Although we may examine its lyrics and music with a magnifying glass, we often fail to consider the new book as a whole. By contrast, we have a very positive overall view of the blue Psalter Hymnal, yet we may have lost sight of some of its specifics. And I’m afraid that many songs from the blue book would fail under the careful scrutiny so quickly applied to the proposal. To give an example, I’ve heard allegations that the new songbook contains hidden strains of universalism and Roman Catholicism—a shocking claim which, if true, would give us great cause for concern. 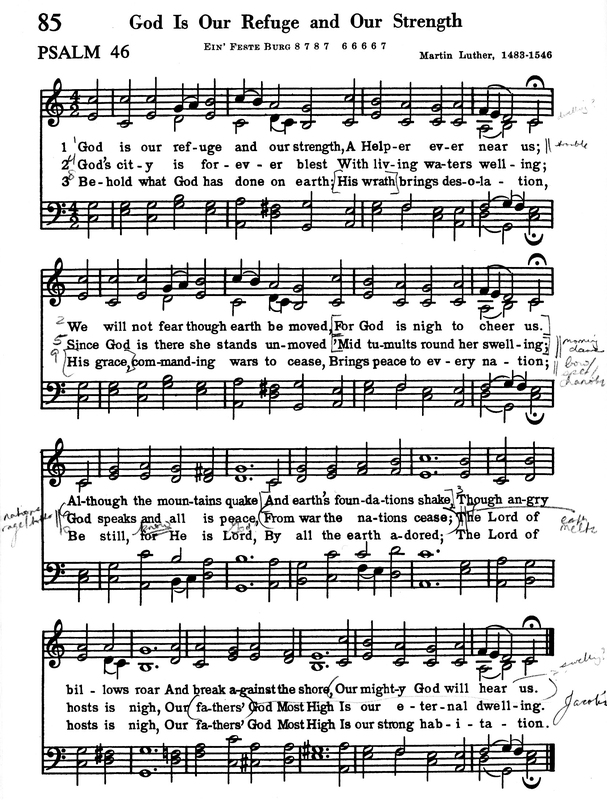 Supporting evidence is drawn from hymns that include lines like “died to save us all,” or from a communion hymn translated by a priest, John Mason Neale, exhorting us to “take by faith the body of the Lord.” Now, in context these lyrics can easily be explained Scripturally: the “us all” refers to the church, and the “body of the Lord” merely echoes Jesus’ own words in Matthew 26. I don’t think heresy is implied in either case. More concerning, however, is the tendency to elevate the blue Psalter Hymnal as the gold standard to which other songbooks must attain. In this case, no mention is made of some of its own hymns that could be interpreted in the very same light. “Hark, the Herald Angels Sing” contains the line “Light and life to all He brings,” while “Faith of Our Fathers” was written by a Roman Catholic priest to commemorate Catholic martyrs. I’m not judging the merit of either of these hymns. I merely want to point out that by this line of reasoning, we would have to conclude that the blue Psalter Hymnal too is a corrupted seedbed for unreformed heresy. Most of all, though, I’m surprised that this conversation is coming to a head at such a late date. We’ve had 19 years to think about this project, to recommend our favorite songs, to share our concerns, to overture our consistories and classes and synods as to what shape the new book should take. We might have even appealed the very decision to pursue a new book. We’ve had access to a complete psalm proposal and two complete hymn proposals. We’ve had every opportunity to participate in the project with a spirit of mutual edification and constructive criticism. Yet 19 years later—and one week before what may be the last vote on the book—we are still asking and answering questions about why the “old blue” won’t remain in print forever, why working together with another denomination is to our advantage, and “why we need a new Psalter Hymnal anyway.” Rather than acknowledging this as a monumental task that requires the active involvement of every concerned member, we apparently prefer to sit on the sidelines and criticize. We criticize the distant and unknown—the motives of the Songbook Committee, the traditions of the OPC—in contrast to the familiar, the good, the safe. Brothers and sisters, let’s remember one thing: the new book is corrupted. It’s corrupted because we are. And the blue Psalter Hymnal is corrupted too—because we were corrupted back then as well. “We do not know what to pray for as we ought,” said Paul, and much less do we know how to sing as we ought. Even the most staunchly Reformed songbook would still bear the marks of our sin and imperfection before God. And that’s why we’re commanded to sing: because we’ve been promised redemption from this corruption, and because the experience of congregational singing builds us up together as the body of Christ. As we fill our hearts and mouths with the words God has given us in the psalms, as well as the words of godly men and women of old—slowly, imperfectly, through thee’s and you’s, Jehovah’s and Lord’s, archaic verbs and clumsy rhyming schemes—still, we learn to speak like Jesus. That heavenly accent we pick up is one not of arrogance and confusion, but of humility and peace. If you’re preparing for next week’s synod, I trust that you won’t base your decision on the new book merely on my words or the words of others, but that you are even now prayerfully considering the question of our songbook for yourself. I humbly urge you to meditate on Ephesians 5 and Colossians 3 as refreshing reminders of the context in which our redeemed singing must occur. Above all, take comfort in this: it is in the very experience of disagreeing over the Psalter Hymnal project that we are being taught what brotherly love and self-sacrifice look like—if our eyes and ears are open.